In a previous article, we talked about how outdoor spaces can be turned into extensions of your living spaces. Outdoor living trends have been on the uptick over these past few years, and homeowners aren’t the only ones who are recognizing the value of beautiful patio set-ups. 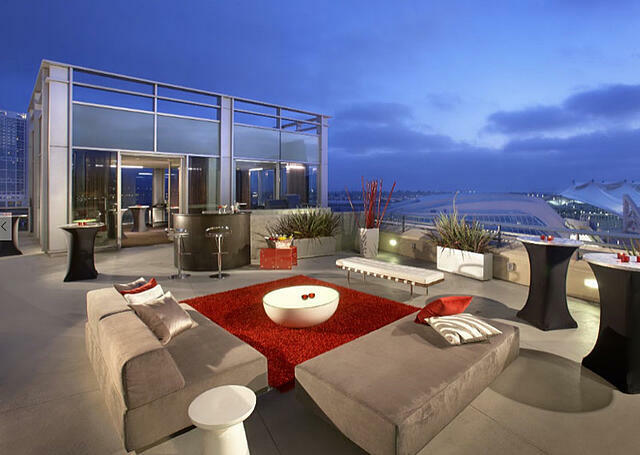 The Hard Rock Hotel in San Diego has a number of gorgeous rooftop terraces and sitting areas such as this one with low seats placed around a water basin with floating candles, and a plush rug. The red, white and silver theme, despite its modern flair, still has a cozy, inviting feel to it. The standing tables, mini-bar and planters serve to accent the whole ensemble. 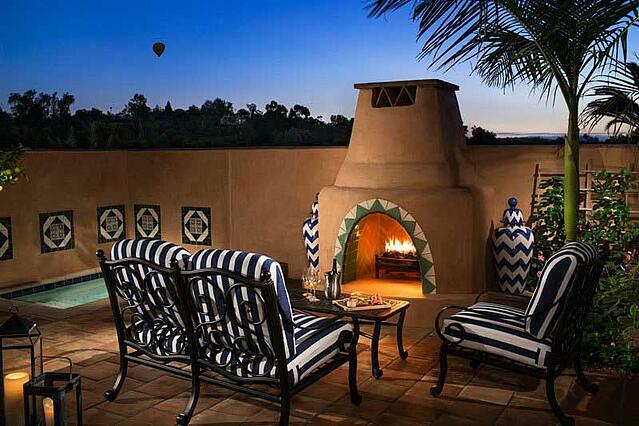 Rancho Valencia is a Spanish hacienda-style five-star resort in Rancho Santa Fe, San Diego. The resort has over 49 casitas, each of which has their own individual terraces and outdoor living spaces. 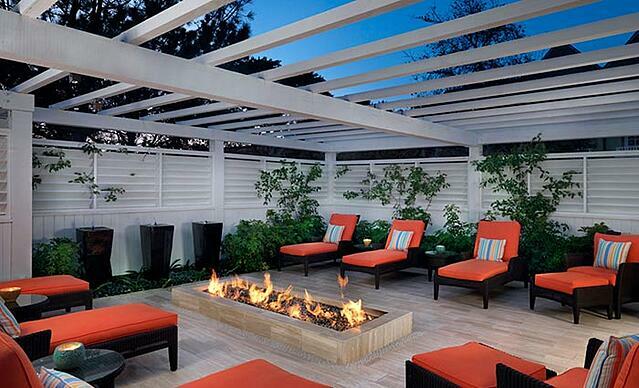 This one has a fireplace serving as the focal point for this patio. The firelight and soft lights from the lanterns douse the whole space in a soft orange glow. It’s the little details that pop out, like the fact that the two vases flanking the fireplace match the furniture. The Hilton San Diego Bayfront Hotel overlooks the stunning San Diego bay, and it’s no surprise that their spaces take advantage of the gorgeous views afforded by their location. Like the Pool Club Lounge with its dark brown wooden floorboards, open arches and the individual group seating spaces, each one unique in its arrangement. The mixture of cane furniture, divans, and stools, coupled with the purple, white and gold furnishings complement the location and the scenery. 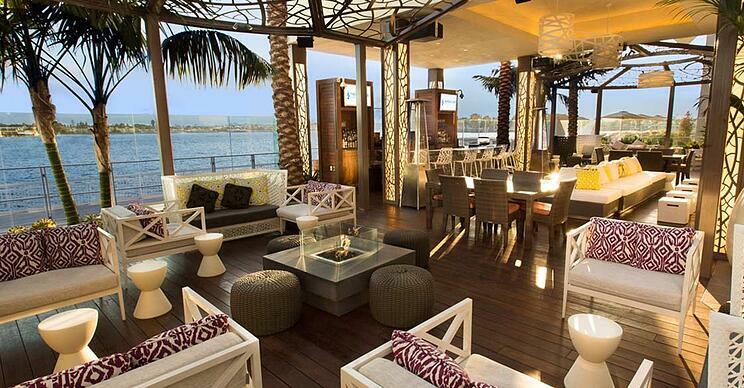 L’auberge Del Mar is located in the picturesque coastal village, Del Mar in North County, San Diego. The design of the patio of their beach resort spa is a classic example of simple, yet exemplary outdoor space design: with a simple arrangement of lounge chairs and side tables around a fire-pit, under a pergola and semi-private walls. That the trend of outdoor living and San Diego’s ever-pleasant weather and gorgeous locales go together is stating the obvious. It may be time for you to create an outdoor space that is a natural extension of your living area.